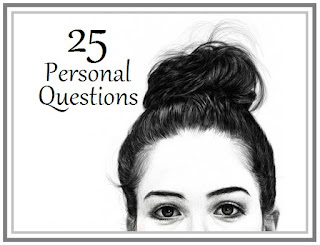 As you can all tell form the title of this blog post, I've been tagged in the "25 Personal Questions Tag". Thank you to everyone who has tagged me and asked me to do this, and I know that I've been taking ages to catch up on my tagged blog posts but I promise I'm getting near the top of them now. Looking into someone's eyes when I am telling them how I feel. I get so nervous and stumble my words. I do. I was really mad at the woman who works at the vets that Daisy is under as a secretary. Daisy has been really unwell for a good long few months now and it's heartbreaking because she's only 11 months old, and the secretary just keeps brushing her off for months now so I snapped two days ago and instead of asking her I told her to make her an appointment at the vets. I'm happy Daisy has been seen but I'm still annoyed at the secretary. Note: Daisy did go to the vets and has been put on special medical puppy food. She has to go back next week for blood tests. My husband. I tell him what's happening and that I love him, and thank him for making my life so much better. I do as I wouldn't like the thought that someone was not able to say goodbye to me who really wanted to, and I spend them with my family. I would be afraid on how people would cope once I am gone but not afraid of dying. 5. You can have one of the following two things. Which do you choose? Why? Love or Trust. Trust. You cannot have love without trust. Of course I save the dogs life! I could always gets a new job. That poor dog is probably in pain and scared, and can't ask someone for help. We need to stand up for animals and support them. I trust and love my husband the same way, and I would rather not be hurt by him at all. I say that I am flattered and I love them but only as a friend. I tell them that I am very happy with my husband and I believe that their is someone for everyone in this world, they just haven't found their person yet. Then I thank them, because telling someone how you really feel does take a lot of guts. Yes. My dog Sassy. I would give up ten years of my life to spend 10 more minutes with her if I could. Yes I think so. A friend to me is someone who I can trust, who cares for me, and someone who is loyal. Not at all. I think a lot of people forget that these days. 12. Your boss tells your co-worker that they have to let them go because of work shortage, and they are the newest employee. You have been there much longer. Your co-worker has a family to support and no other means of income. Do you go to your boss and offer to leave the company? Why or Why not? I think it would all depend on the circumstances. But honestly, I probably would offer to leave. 13. When was the last time you told someone HONESTLY how you felt regardless of how difficult it was for you to say? Who was it? What did you have to tell the person? I told Phil, and that's private. I think this comes back to question eight a little bit. I think it would be harder to tell someone I don't love them back. There are so many things! My husband, pets, family, and friends I think. Oh and our home. My dad on the phone. I would like Daisy to feel better but not a lot else I can think of. 18. Imagine it is a dark night, you are alone, it is raining outside, you hear someone walking around outside your window. WHO do you wish was there with you? Yes, of course! I can't imagine someone who wouldn't save another human's life. 21. You are holding onto your grandmother’s hand and the hand of a newborn that you do not know as they hang over the edge of a cliff. You have to let one go to save the other. Who do you let fall to their death? What was your rationale for making the decision? I would push the two of them back and jump myself. I think I am in some ways yes. I gave the British heart foundation £100 a couple of days ago which I had raised. True love with a guarantee of a broken heart. I think everyone needs to feel loved sometimes and remember that feeling. Cruelty in the world of all kinds would stop and vanish. Again thank you to everyone who tagged me in this tag, I hope you enjoyed reading it. I want to tag Chloe and Becky in this tag. If you do this tag or have done this tag before, please leave the link below or tweet it to me so I can read them all. Thank you!